Considered the most influential car of the 1930’s, the Chrysler Airflow was the brainchild of engineer, Carl Breer, who put into it the most modern concepts of automotive and aviation design. Airflow bodies were constructed around a cage-like steel girder network, to which the body panels were welded. The body and chassis were one integral unit, making the Airflow the forerunner of today’s unit body construction. 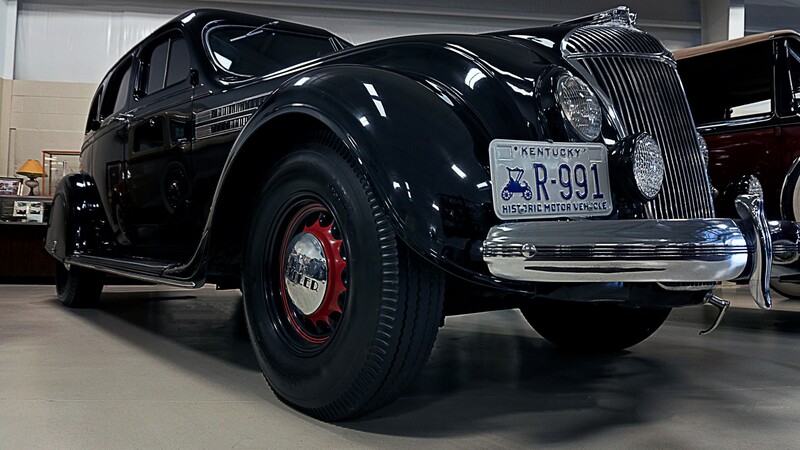 The Custom Imperial was powered by Chrysler’s largest 323 cubic inch in-line eight, rated at 130 horsepower. Wheelbase was a huge 137 inches. Weight was approximately 2½ tons. Although years ahead of its time, its advanced, extreme styling, hurt sales of the Airflow. Only 38 of the model you see here were built, making this a very rare car, indeed.